Happiness in the workplace is an essential cog in the growth of all successful and sustainable companies. It creates wellbeing within your staff, increases productivity, lowers absenteeism rates and creates a healthier environment that your staff want to work in and in return your staff feel valued and willing to go that extra mile when needed. I have with interest followed companies and leaders that are championing the importance of wellbeing in the workplace. Companies like Zappos with Tony Hsieh at the helm and Semco with Ricardo Semlers innovative approach to autonomy at work. Another name that has been leading this field is Henry Stewart. Henry created the aptly titled Happy ltd a company that started in the field of I.T training and now helps companies to create happier workplaces. No freedom to execute the job. Henry went on to create Happy ltd and 21 years after his experience with “The News on Sunday” he had led Happy Ltd to the position of 18th best workplace in the UK. The desire to want to turn up to work each day rather than to feel they had to. He outlines how he did this in his book Happy manifesto. Here Henry asks questions that every one who runs an organisation should be asking of themselves and their staff. What can you do as a manager or colleague to make your people feel good now? How would your organisation be different if its key focus in management was on making its people happy? What would be different in your organisation if mistakes were encouraged and welcomed? Do you encourage your people to play to their strengths rather than focusing on their weaknesses? These are just some of the questions that managers and company owners need to ask to grow the company that will serve us, our staff and our customers well. Otherwise we end up as corks bobbing in the ocean screaming “I must have control, I must have control”. 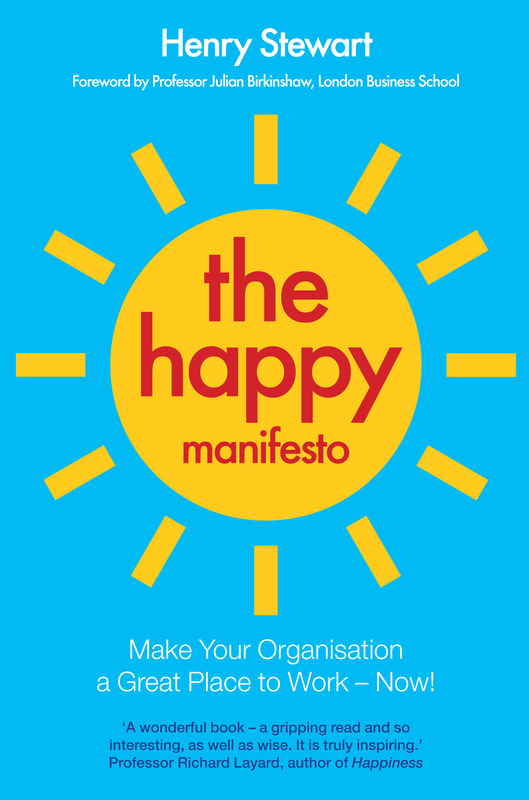 Well the cool thing is that Henry is organizing a Day on the 24th of April where you can get to meet him and some other fantastic speakers on the benefits of creating a happier workplace for you and your employees.If you can not make it a copy of the Happy Manifesto is recommended reading for all who are willing to make the leap to happiness at work.